My best friend celebrates her birthday today; my Mom! She's without electricity this morning as she's been since Irene paid a visit to Abell, Maryland real early on Saturday night. My parents had quite the night. Woke to tree limbs all over the yard and a tree in their pool. The worst of it was the howling wind from what Mom says. Now when will the electricity be restored? Hope it's soon for those in Southern Maryland. On my design wall today is still Jamestown Landing which I've decided to name Kolonial. I won't bother with a photo because there hasn't been a change since the post last week. I did get Crazy Jacks backing sewn together. Lot's of purples! Ready for Kerry with backing, batting, and binding. We may have a bit of final top assembly to do on Saturday, but I'm thinking quilting is in store for this project on the weekend. I also finished putting the binding together for Komet. I was somewhat perplexed on what fabrics to use. The pink really changed the over all look. Not in a bad way but made it difficult to decide how to go for the binding. I ended up with a pieced binding of the batiks used already. I'm pleased with the results. I'll be showing you what I've done soon. Last but certainly not any less important...probably more so! My August UFO is started. I've only sewn three of the 26 sections...but it is a start. I'm not foreseeing any problems in a completion on Wednesday. If you get the chance check out other Design Walls from other quilters today at Patchwork Times. 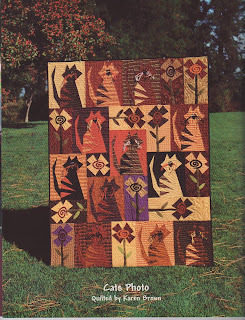 There are some very creative quilters among us. Today is the day to sew my UFO for August. 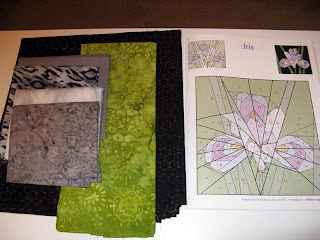 I have an Iris block by Linda Causee to make for Kourageous this month. 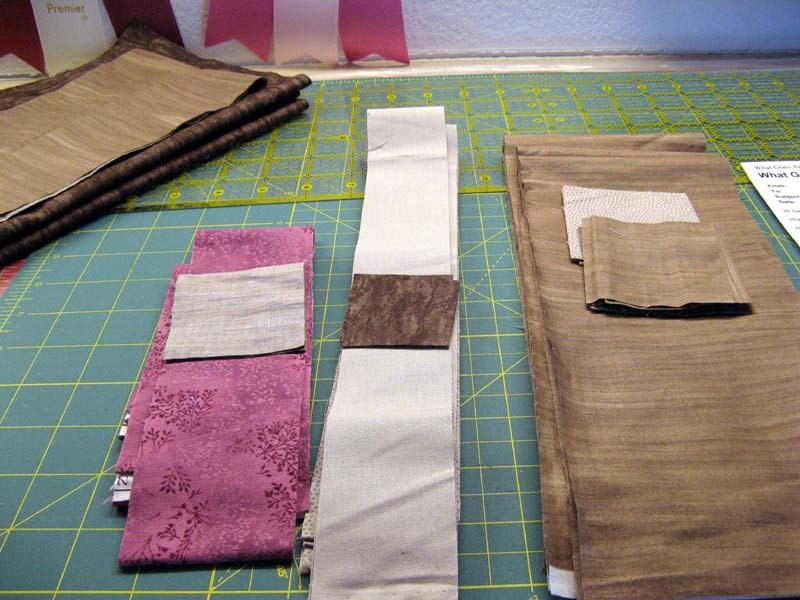 I picked out all the fabrics on Friday. Here's what I'll be working with. 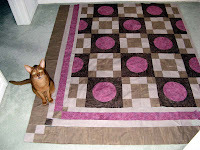 Kerry finished quilting Komet. I have to find something suitable for the binding. Hope to get it sewn down for hand sewing during the week. Komfort Kove was finished this week. I'm thrilled with how it turned out. I just love the combination of fabrics. This shade of blue is one that I could sew with anytime. This week nothing purchased or used. Next week I will have Crazy Jacks yardage to report used, but its still in too many pieces yet to call it finished. 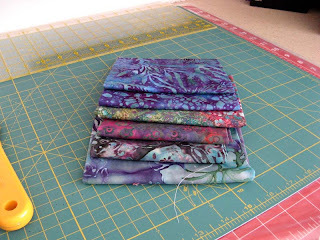 This is a photo of the 10 1/2" blocks for the back along with the binding. 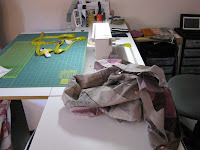 Kerry has the top on her design wall for some sewing this week. 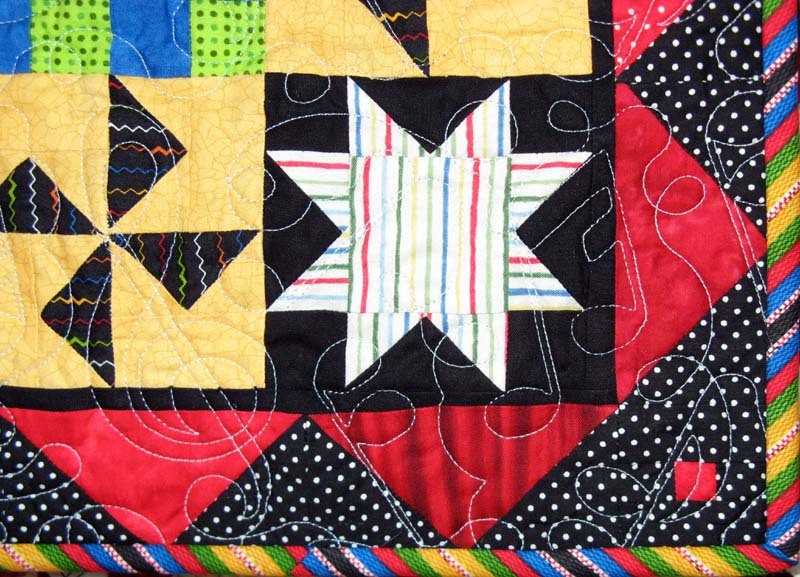 We hope to get to the quilting on Saturday. Be nice to have this one done a little early. So here's my report for this last Sunday in August. Check out how other quilters are using OR adding to their fabric stash at Patchwork Times. 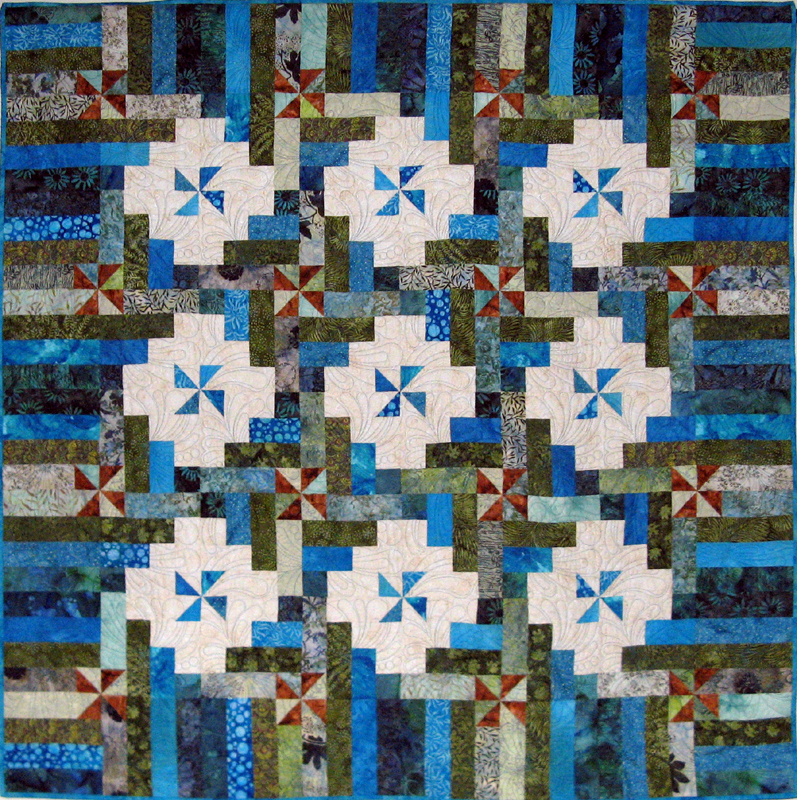 Good morning quilters! 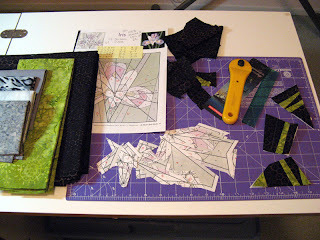 Wish I had another day to spend in my sewing studio, but alas Monday is upon us. That means the start of the work week for me. Crazy Jacks by Buggy Barn is one of three projects on my design wall. This is a project that I am making with Kerry for our contribution to the new membership year's fundraising efforts at Sunshine Quilt Guild. I had the "Jacks" (pumpkins) done on Saturday. All that is left is to square them up. Kerry is assembling the candy corn border. 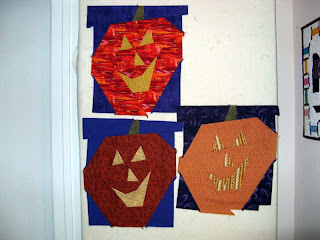 There is another dark purple border after the candy corn which I have got a bunch of purples to start cutting into the proper size rectangles. We might be in a position to assemble on Saturday. 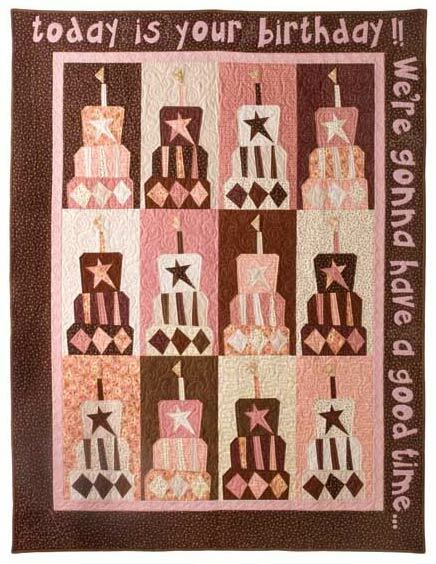 Its a bimonthly opportunity quilts with September 12th the first chance to purchase that winning ticket! Next up is Bonnie Hunter's Jamestown Landing. It's a start in the first photo. 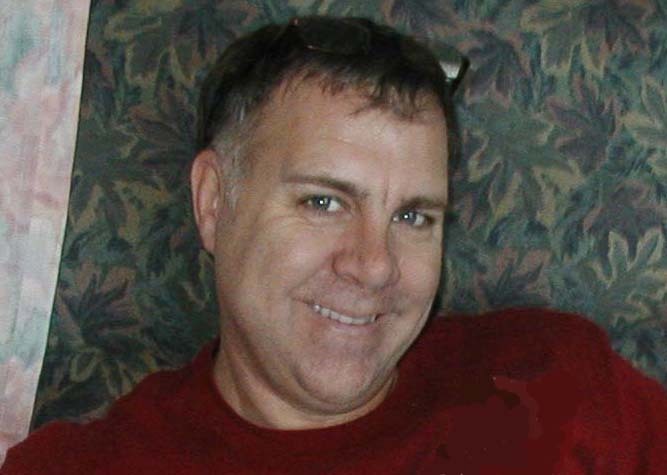 I'll be working to mix the HSTs up with more neutral variety. You can see from the second photo that there are lots of pieces to work on yet. I will be taking the neutral squares with me to draw lines through the centers during my lunch break getting ready for sewing the 420 sets into 840 HSTs. The first row is the light row and the second row is the dark row. 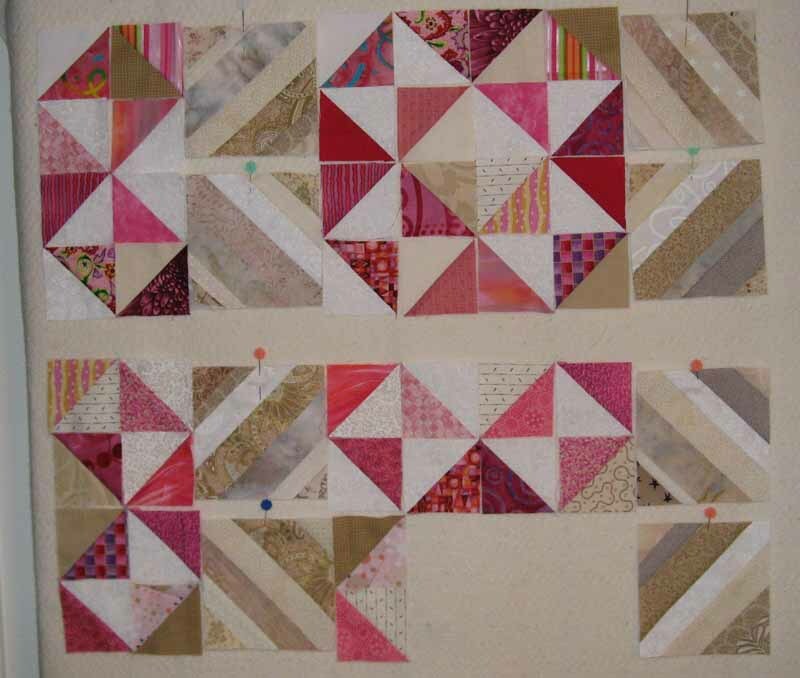 There's to be three of each with lots of sashing rows between of the strip blocks. I have been using my new Bloc Loc 2.5" square up ruler...loving it! So what have you been working on to show us today? 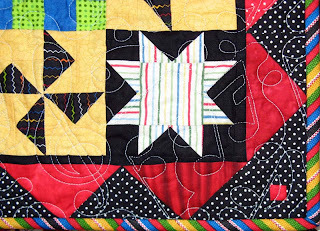 Visit other quilters in their sewing studio at Patchwork Times. I've been busy this week! 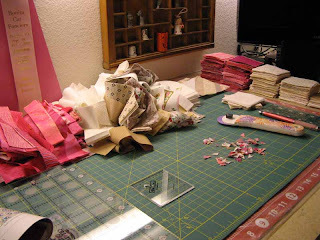 Friday was my OFF Friday...my sewing studio was my haven for most of the day...YIPPEE. I worked on Bonnie Hunter's Jamestown Landing which is still at the cutting stage, getting the binding sewn on to Komfort Kove to be ready for hand sewing during today's Charger's game, and finishing Kalm. I also hand sewed in place two labels on Koasting and Komfort Kove. I'll be helping my Mom with a label later today for one of her quilts. 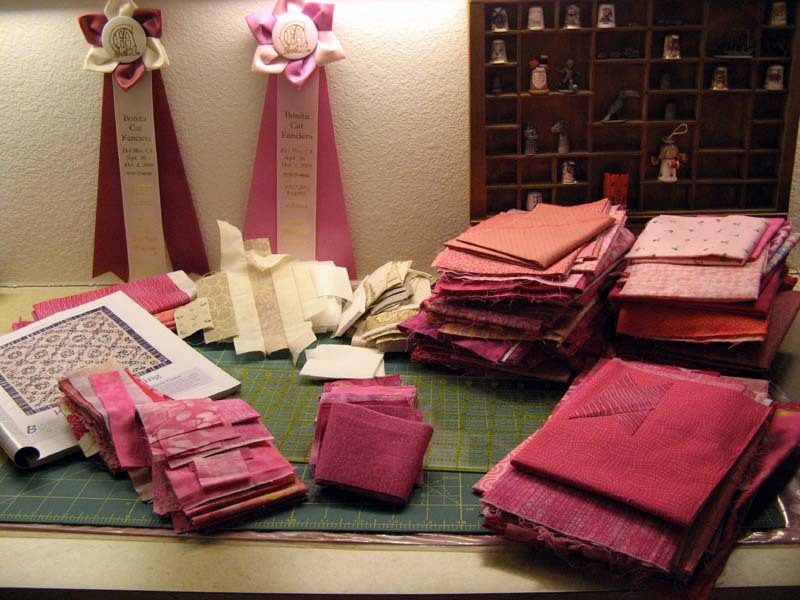 Kerry and I are working on the September/October Bimonthly Opportunity Quilt for Sunshine Quilt Guild that is our contribution for this membership's year of fundraising efforts. We are making Buggy Barn's Crazy Jacks. 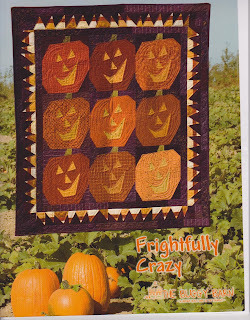 Kerry will be sewing the candy corn border and I will sew the pumpkins. 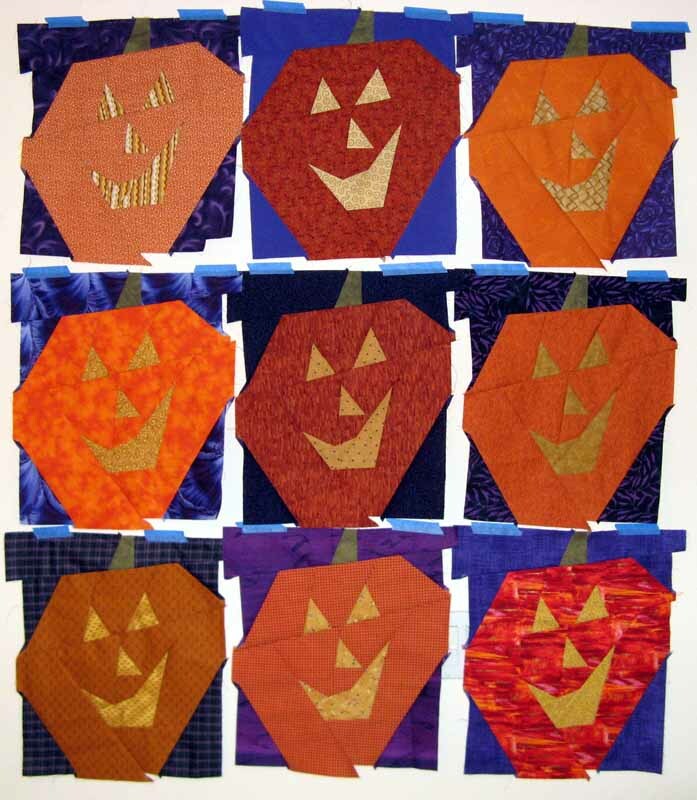 I had three of the nine "Jacks" (pumpkins) already sewn before I started on Saturday; now all nine are done and ready to be squared up. Kerry will be working on the candy corn during the week. Speaking of squaring up. Have you seen the Bloc Loc square up rulers? The company makes them for HSTs and flying geese. I listened to the excitement at Amidon's about them, watched the video...and decided I must have the HST rulers. I purchased the set of three that included 2.5", 4.5", and 6.5". I'll be purchasing the 3.5" when I can find it sold individually. It comes in other sizes that include 1.5", 5.5", 9.5" and 12.5" I believe. I'd like to check out the flying geese square up ruler too. It could be as functional as the HST square ups are to me. For this week I have the fabric used to make Kalm to claim. Almost all of it from my stash. I did purchase two pieces to fill in, but they didn't collect any wrinkles in my storage bins! I did purchase the Bloc Loc HST square up rulers...but we aren't counting gizmos...and I'm not going to start! 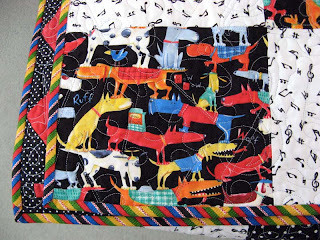 After learning about the 2011 Pets on Quilts sponsored by sewcalgal I read all the entries that had been submitted through mid day Monday…45 of them in total. 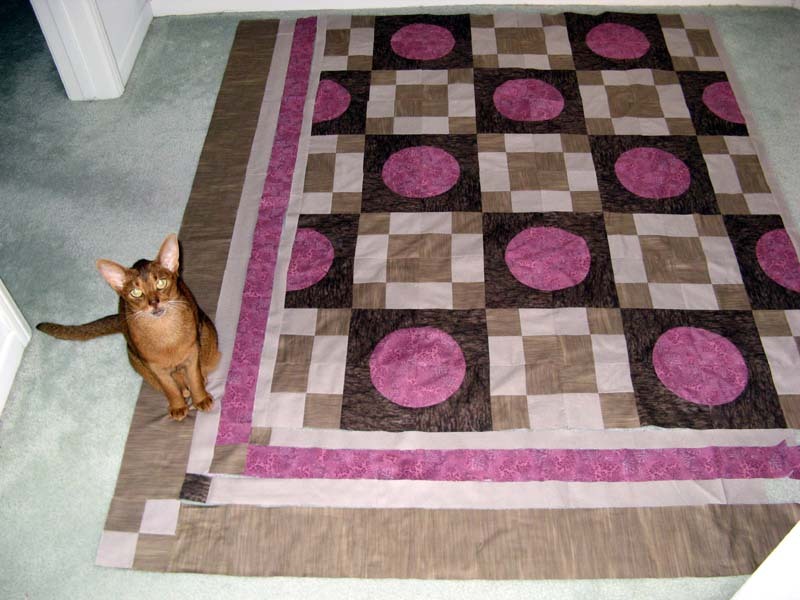 There are so many great stories of cats, dogs, and even bunnies; not to mention all the great quilty projects. There is so much love expressed in these posts at times it was overwhelming to read. There are a lot of angels among us. 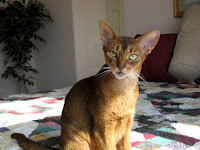 So where should my Pets on Quilts story start? 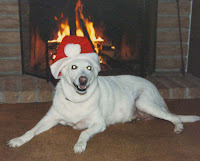 Dutchess came first; a beautiful, loyal, and very smart white German Shepherd. Dutchess has been gone for sometime now, but I’m always reminded of her when I see someone walking their white shepherd. For me there will never be another Dutchess. 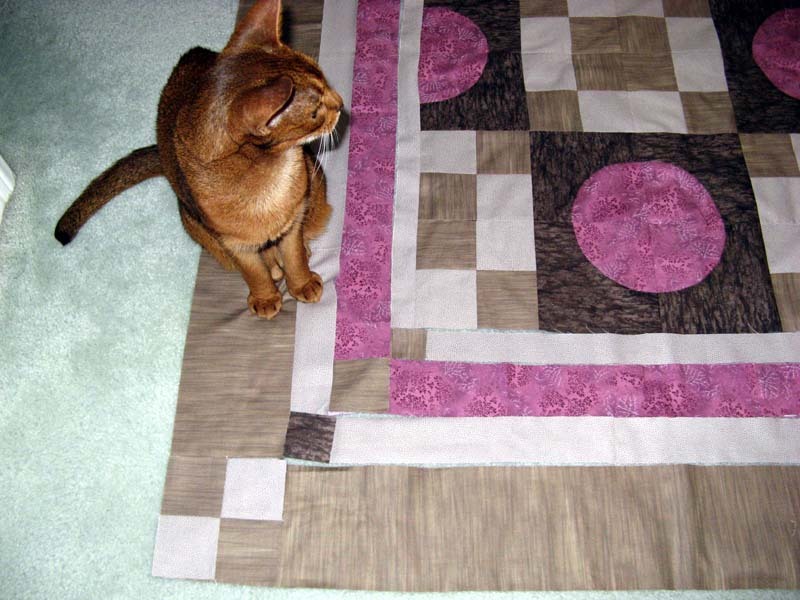 She never knew my sewing path would move to quilting, but she enjoyed the comfort on my bed with Grandma’s quilts. I've had a quilt made by my Grandma since I was a child. Let’s fast forward to 1999 when Kaos came into our home. A beautiful tiny Abyssinian kitten of 12 weeks (our first experience with a cat). We were on the hunt for this particular breed of cat because of its dog like traits. Kaos is every bit of her name which is also completely true of “Abys”. It’s this same year when my desire to quilt took shape. Kaos is sitting on my second quilt Happy to be Scrappy. Learning how involved a cat can be…it was ever apparent I needed to keep my tools and notions away from her inquisitive and playful soul. 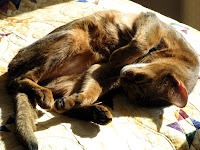 In 2000 at 10 weeks Komotion (KoKo for short) joined our happy family. Kaos quickly became friends with KoKo (like he had any choice). Here he is basking in the sun on the more recent Kapella. He’s rambunctious too, but a bit more skeptical to attempt any of the crazy antics of Kaos. When he does a Kaos type antic it takes a moment to realize it's him. Yes it’s hard to tell the two apart, but you know parents always can. 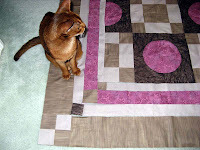 ﻿My quilting projects have included lots of cat theme; from quilts and garments to dolls. Dogs, bunny, lamb, duck, frog, bears, whale, eagle, horse, chicken, penguin, reindeer, dinosaurs, sea horses, bugs, and a monster are also part of my projects. 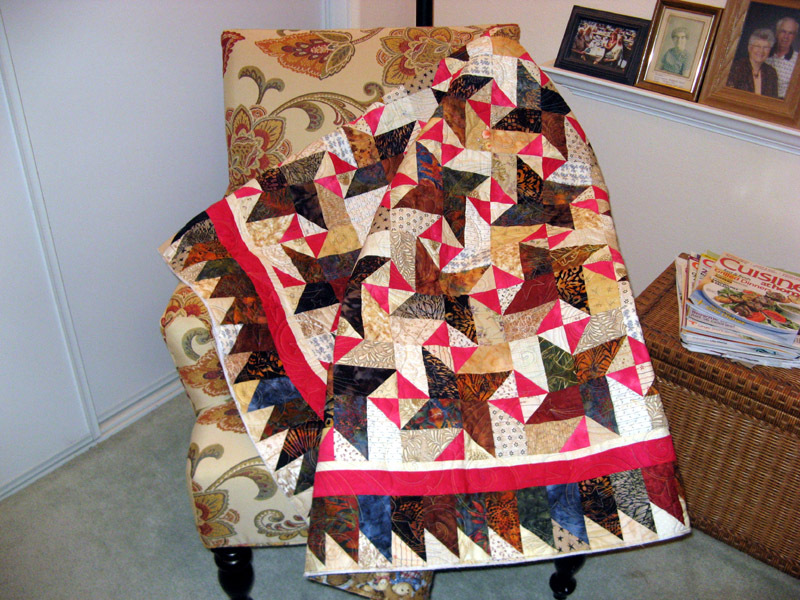 These quilts are in my home, gifted, donated to various charities, and commissioned. Kerry and I have made quilts for the annual “Fur Ball” that is the annual main fundraising event hosted by the San Diego Humane Society and SPCA. This is our seventh year to donate. We delivered just this week Dancing with the Dogs for the 25th event that will be held this Saturday. Hopefully this will be a banner year for their “Fur Ball” with the quilt making a large contribution. 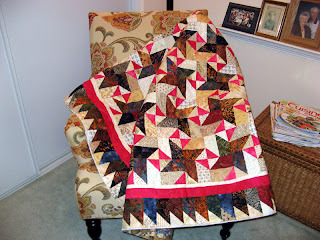 I have shown you just a few of my quilts with this post. Leave a comment to give me a chance to win some prizes (you can win too). More can be seen on my Animal Theme Quilts Page on the side bar if you want to take a peek. Use the Home Page on the side bar if you want to return to this post. Good luck to everyone! cream and anything else with just a touch of pink that might be hiding. 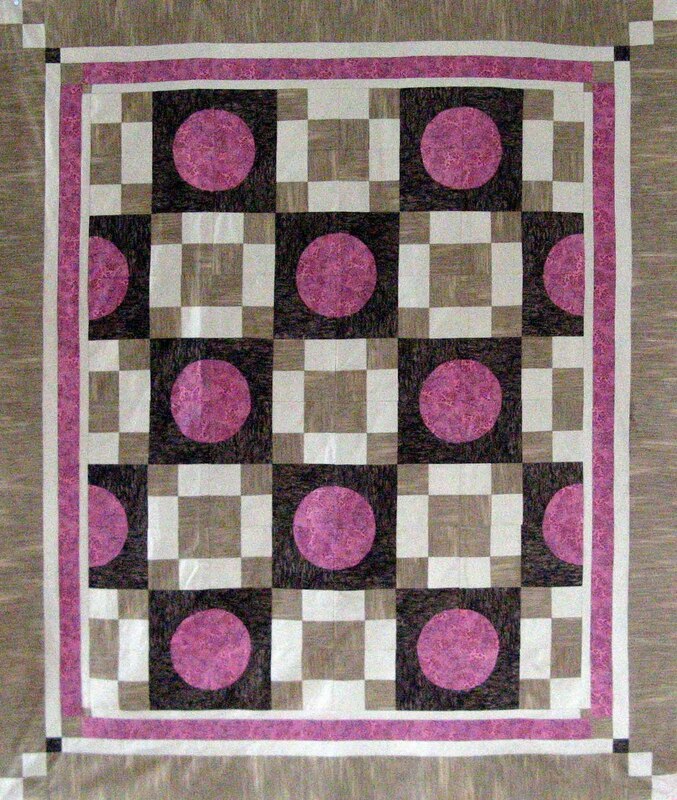 It takes 2 7/8" pink and neutral squares (420 each color) that will be made into HSTs and strips of pink and neutral varying in size from 3/4" to 2" wide. The length of the neutrals up to 9". The pink also take varying sizes 1" to 2 1/2" wide to be cut down to 5". I'll be busy with the cutting for a little while...the three stacks on the right are what's to be done yet...yep I'll be busy for a little while. 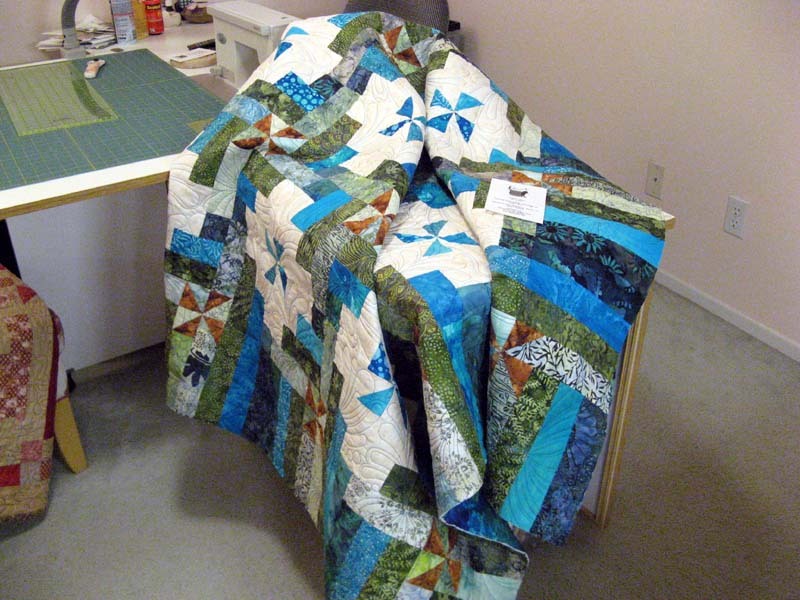 This is Komfort Kove just back from Kerry's Quilting. 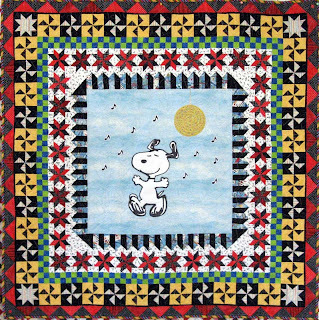 It's a Quiltmaker pattern (July/August 2010) designed by Theresa Eisinger called Pinwheel Cove. I've got to get the binding on and the label. 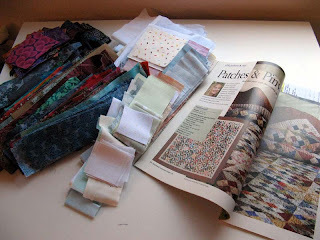 Think I'll choose a teal for the binding...there must be a 1/2 yard piece in my stash that will work. What do you have going on in your sewing studio this week? 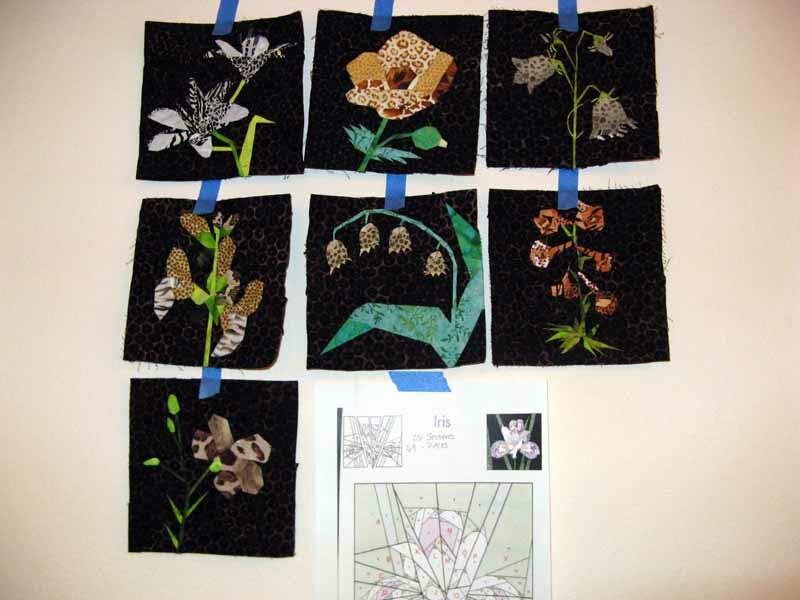 Check out other works in progress through Patchwork Times (look for the button on the right). Lots to look out every Monday. Be creative this week! We've got a finish! Kerry and I managed to beat the clock once again. We finished the San Diego Humane Society and SPCA 25th Annual Fur Ball Fundraiser just today. We call it Dancing With The Dogs which is the theme of this year's event that is being held on Saturday, August 20th. This was Saturday at Kerry's sewing studio. She's busy chatting with her Mom and quilting Dancing With The Dogs. Yes, we both are multifunctional kinda gals! The next couple of pictures are close ups. We were a bit worried that this great stripe scrap (just perfect for this quilt) wouldn't be enough to get all the way around if we cut it on the bias. 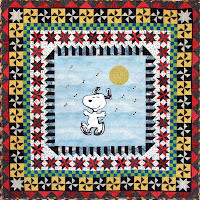 We wanted the stripes moving to further the look of Snoopy dancing. Yeah, it did with 10" of binding left over. We know how to calculate strips and the resulting yardage, but how do you do it when you cut on the bias? (We just kept our fingers crossed--wink!) The selvages were cut away, but 99.9% sure this cute dog theme fabric is by Michael Miller. This fabric just makes me smile. 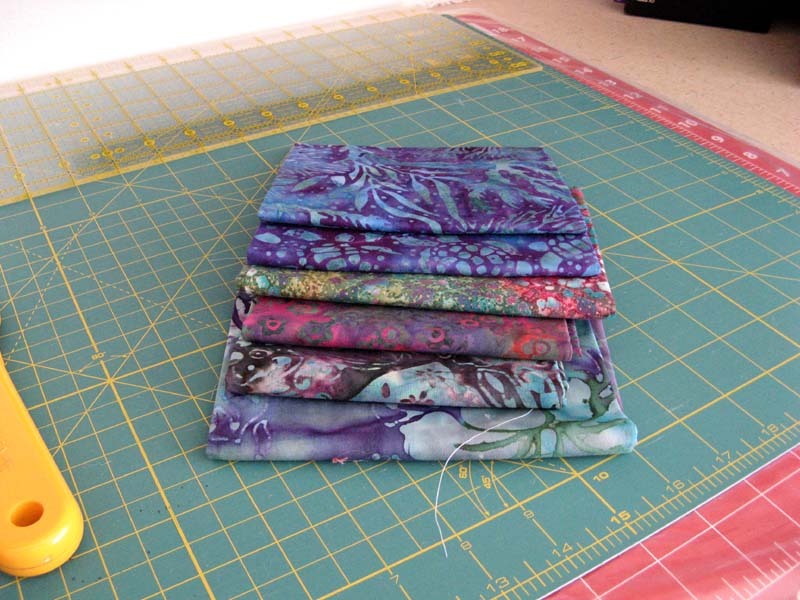 Kerry and I split the yardage for Dancing With The Dogs since we both used our stash for it. My two purchases were at Amidon Quiltworks; 1/2 yard to finish up Kalm and the other 1 1/2 yards for Kooky Kins. Both fabrics have already been used, but not quite ready to claim in my report...soon though! I participated in a workshop last night...one of those unexpected ones (wink)...that was real fun. In the past several years I've purchased three different Buggy Barn patterns. Crazy Dog Days, That Crazy Thing We Do, and Frightfully Crazy. The designs are just too cute! 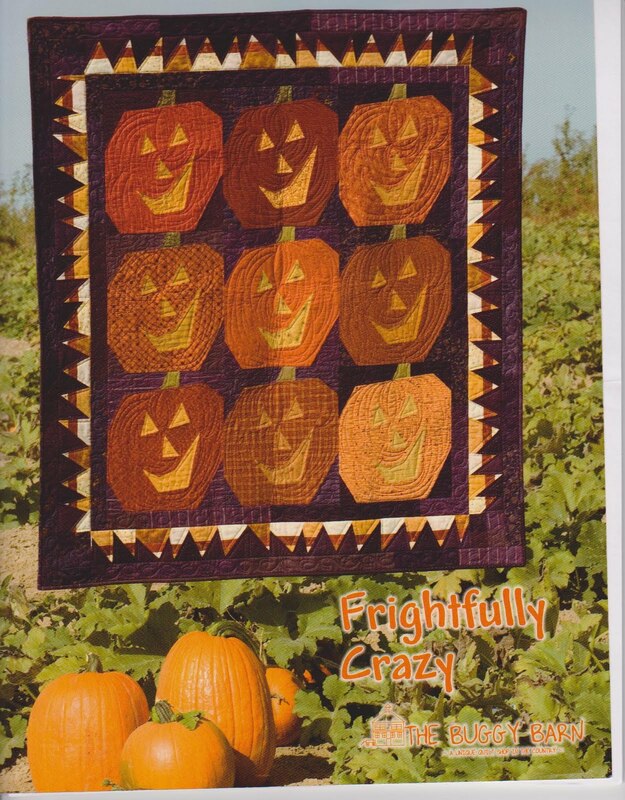 Last year I got the Frightfully Crazy Pattern Book and even started collecting some oranges for the nine pumpkins in the cover design. 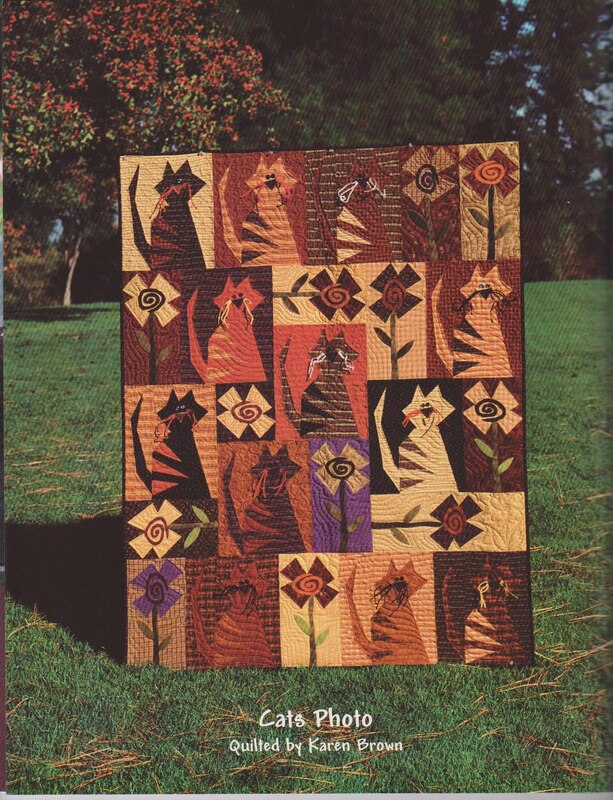 Needless to say the three patterns Crazy Jacks, Crazy Cats, and Crazy as a Bird Dog haven't made it to the top of my to do list...although they've been not too far from my thoughts. Every time I visit Amidon Quiltworks their Buggy Barn Club speaks to me to join. I went to Amidon's on Monday and I kept on hearing "join me, join me" as I glanced at the information posted about it while having what I went there for cut. The Club meets the first Thursday of the month and you work on any Buggy Barn pattern while being surrounded by other Buggy Barn enthusiasts. I've been concerned about the commitment part of the Club, but know without a doubt I'd enjoy myself every time and I'd be getting the three projects done. So I brought up my desires and of course was encouraged by the staff...then when they learned why I was reluctant (the commitment part) they said "well that design Crazy Cats is a two part workshop in September; very little commitment with that". They were right and I signed up for the workshop. Then while they still had my complete attention it was pointed out that behind me was another design also Buggy Barn (Crazy Jacks) with the class held on Thursday. So I ended up enrolling in both workshops! 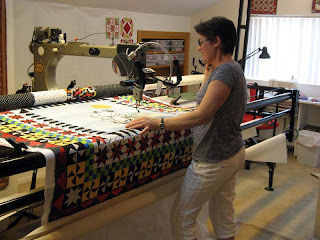 What's great is the educated talent of Julanne Bergstrom who has some connections with the Buggy Barn Quilt Shop leading the way. We first prepared our fabrics with iron and starch. Stacked our fabrics, ironed on our freezer paper template and began cutting out the pieces. First with the frame parts (purple), then stack, iron freezer paper template pumpkin parts (orange), and finally stack, iron freezer paper template eyes, nose, and mouth (gold). I had three Jacks assembled by the end of the four hour workshop. Julanne went over the Candy Corn border, but that is to be done after all the pumpkins are finished. 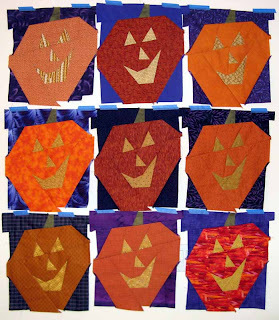 Since the Candy Corn assembly is a bit tricky those not familiar with Buggy Barn patterns were invited to come back to one of the "Club" evenings if we needed help. I think I may have it figured out, but will work on it before September 1st to make sure I don't need more guidance. So now there is a plan to get two of the three Buggy Barn projects complete. 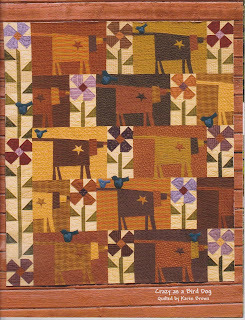 Julanne says that the Crazy as a Bird Dog pattern is a workshop she'll be doing in 2012. Of course that means I'll be signing up! 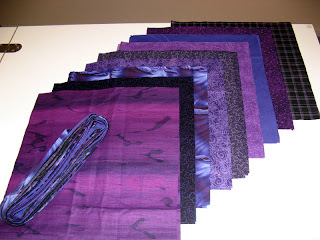 Best of all making Crazy Jacks used my stash all except one purple FQ (Buggy Barn Patterns are designed for FQs). Just love to use up that stash! Tomorrow I'll be busy with Kerry finishing the San Diego Humane Society's 25th Annual Fur Ball Fundraiser quilt "Dancing with the Dogs". You remember the one with Snoopy Dancing. Pictures on Sunday! By the way, I've added to my Birthday/Christmas Wish List Celebrated Craziness Book Patterns found on the Buggy Barn website for $24.00. I'm interested in making the Today is your Birthday project. Not too much to show right now. I'm at a stand still with Kalming :(! I ran out of the light fabric to finish the top and bottom on Border #1. Amidon Quiltworks where I purchased the fabric was closed this weekend. They'll be back at 10am today...guess where I'll be going sometime today? Here's what Kalming will look like when finished. I like how the corner stones and the 4-patch carry out the center. I think Kaos likes what she sees too! This week I've spent time on two different projects and some stash diving and cutting! Nothing to report as used, but that will change soon since Kalm is coming together nicely. Oh, the .25 purchased is for more of the plum for border #3. I'm going to split the used on the other project that I'm assembling with Kerry; the San Diego Humane Society's Fur Ball fundraiser. 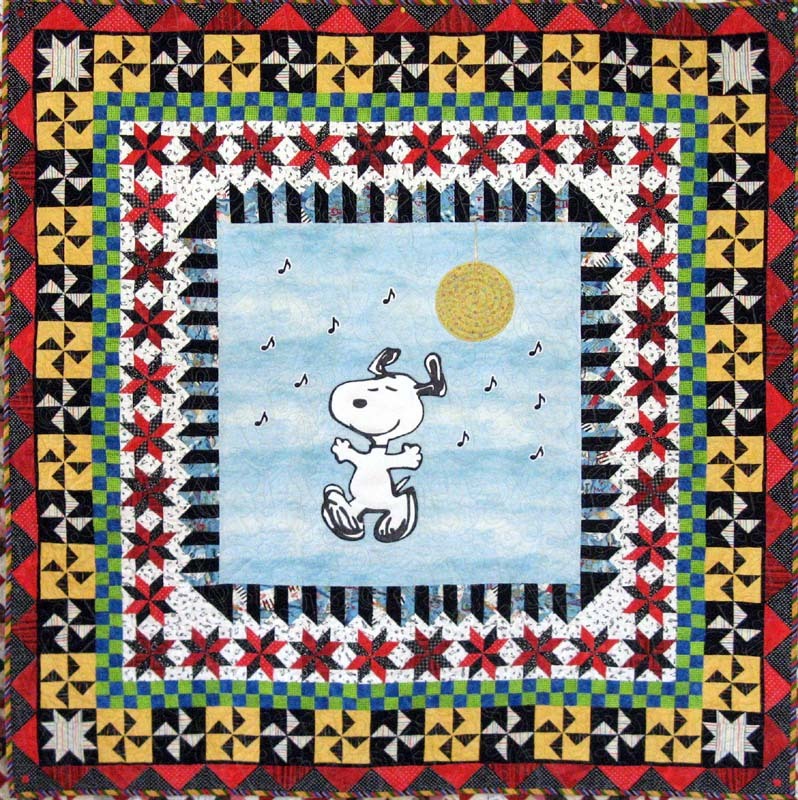 You remember...Dancing with Snoopy? I had that on my wall this past Monday. My Stash work is for two projects I'll be working on soon both Bonnie Hunter projects; Jamestown Landing and Patches and Pinwheels. 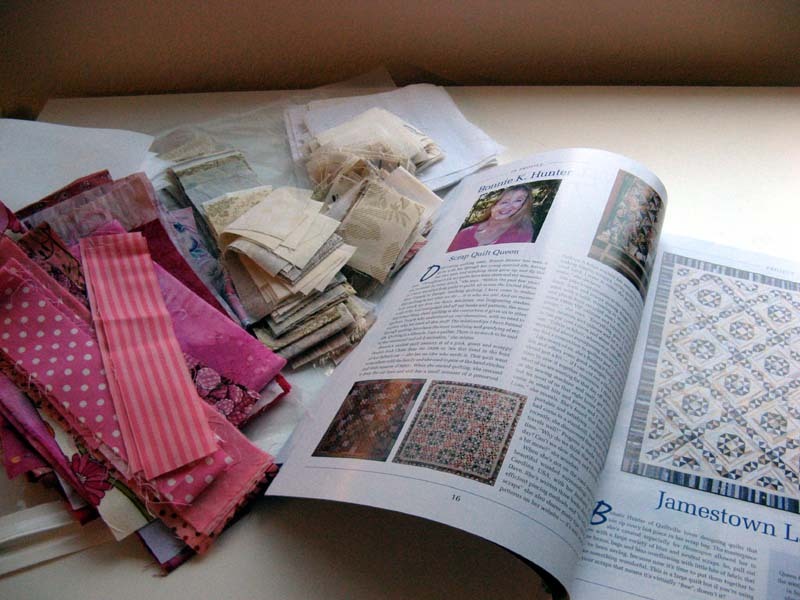 Both of these patterns are from magazines (Australian Homespun and Quiltmaker September/October 2008). I'm hoping the Patches and Pinwheels can be done for the Quilters Club of America Quiltmaker Show and Tell First Friday Contest for September or October. 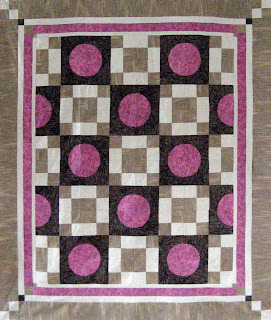 Patches and Pinwheels also just happens to be one of my 2011 UFOs. 169 Pieces and 25 Sections! 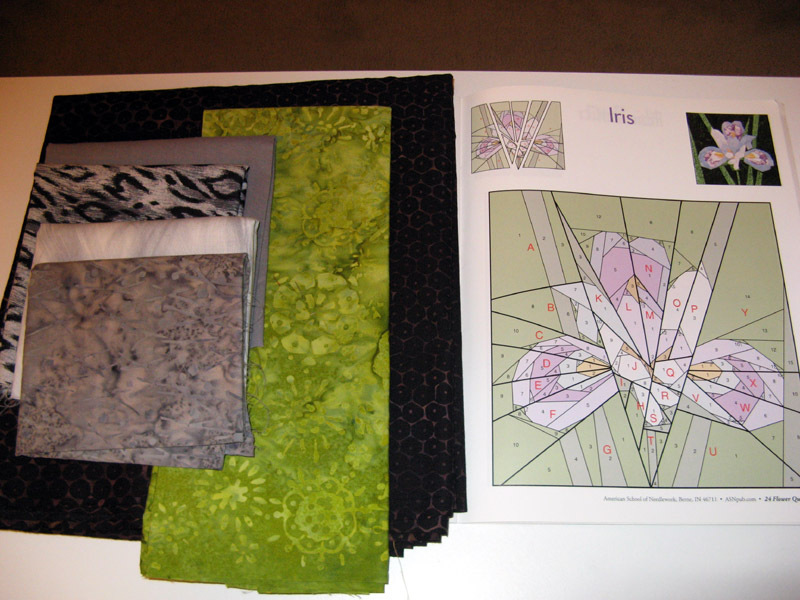 That's how complex the Iris block by Linda Causee (August 2011 Challenge) will be for the animal theme flower project that is Kourageous. I'll be getting to this soon too. Check back again to see my progress. And all the angels sing. Sent from earth to heaven above. On the wings of snow white doves. Tonight is Bunko, with fabric FQs as anty and the prizes. I wonder if my winning streak will continue? In December I won red and green batiks and last month I won red, cream, and blue batiks. This month the anty is blue and teal batiks. It is always batiks! 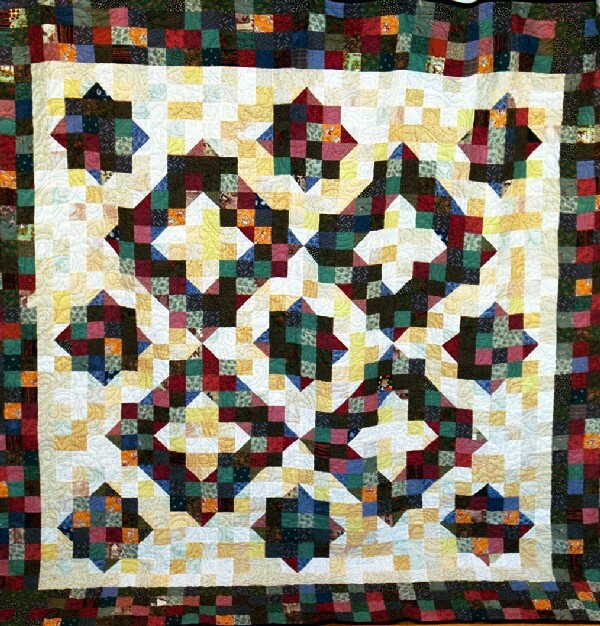 Memory Lane Quilt Shop in El Cajon has the game first Monday of each month. Hope you have a great week. Hope you have time to look at other Design Walls from quilters around the globe at Patchwork Times. Be sure to leave a comment.